There are many different way to get healthy, one way is to take supplements and different sorts of herbs full of vitamins and antioxidants that do wonders for your body. Why doesn't everyone take these, you may ask? Well, supplements can be very expensive and a lot of these wonder herbs have a taste similar to that of socks in a football player’s gym bag. Well, a solution to both of these problems can easily be found in empty gelatin capsules. Gelatin capsules are available in many different sizes and flavors to make sure anyone and everyone has the ability to make getting healthy a pleasant experience that won’t leave you with a huge hole in your wallet. Natural health items such as oregano oil, chaga mushrooms, or apple cider vinegar can do amazing things for your body, but the taste of these items could gag even the toughest of gym buffs. With flavored empty gelatin capsules you can get all the benefits of these products without having to endure the awful taste. They come in a variety of fruity flavors such as berry, lime, orange, grapem and strawberry. Don’t like fruit? They are also available in flavors such as coffee, bubblegum and mint. But maybe you’re a big burly body builder and all those flavors still sound like kids ice cream flavors, well there are also a variety of meaty flavors such as pork and bacon that will make getting healthy taste like the manliest experience of your life. Taking supplements, although very good for your body, is definitely very unhealthy for your bank statement. With empty gel capsules you can buy the supplements you want in bulk bags and make your own pills instead of spending ridiculous money on pre-packaged pills with the exact same result. Making your own supplements at home can save you more than half of the money you would normally spend on store bought supplements. 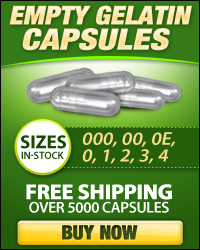 Don't have the time to stuff your own capsules? Well there are even machines that will do all the work for you. Empty gelatin capsules are an all-around good idea to keep your body, taste buds and wallet all healthy and happy at the same time. Supplements, even natural ones, could have interactions with medications and certain illnesses so always due your research and talk to your physician before taking a concoction.